Anyone who has siblings, children, niblings, or babysits, knows that sometimes it's hard to keep children occupied. It often falls to the older siblings or aunts/uncles to entertain the younger children in a home. Sometimes there are things you'd rather do then play with children, but the time you spend with them can really influence them in a powerful way - even if you're just doing simple things. I looked through my scrapbook and found pictures of things my siblings and I did together - I've got so many good memories of the times we had together! I hope that you enjoy the pictures, and get ideas of things you can do with the young ones in your life. Since I already did a whole post on games, I won't post anymore pictures of them! =) Playing them can be a wonderful way to enjoy doing things together as a family. From simple games of "Go Fish" to long games of "Monopoly", there's plenty to choose from to appeal to each child's ages and interests. If you have sisters, they probably never get tired of playing dolls. I'll be the first to admit: I often grew very tired of playing dolls with Jubilee. In fact, I remember sneaking off a few times to play dolls by myself so she wouldn't ruin my story (shocking, I know!) ! However, playing with dolls is a way a little girl learns to be a mommy, and they always love it if big sisters play along. There's innumerable things to do with them. A favorite of mine was to take our little dolls camping outside. We'd lay down old sheets, make tents out of blankets, pack bundles of cloths for each doll, and have fun playing in the warm, spring air. Other times we'd make matching cloths for our dolls; Miriam would give us scraps of fabric, and by cutting two arm holes and wrapping the cloth around with a rubberband, you had an instant dress! Other times we'd mommy our baby-dolls or make up adventures for our big-girl dolls. Another thing to do with sisters is to play dress-up! I don't know if a girl is ever too old for dress-up. =) Finding pretty things to wear and pretending to be a princess thrills any little girl's heart! Girls, don't hesitate to play "boyish" things with brothers, either! Lydia, Elijah, and I often played cars together - though we gave each car a personality to make it more fun. We made towns for them out of styrofoam and designated cars to be children, police, or "bad guys". Elijah didn't have brothers his age, so I'd often play army men with him - and enjoy it almost as much as he did! Don't just stay inside either - go out in God's beautiful creation! When we were younger, we'd romp outside all year long, climbing trees, making trails, building forts, or playing ball. By raking leaves together, you can accomplish something worthwhile then have fun jumping in the big piles! Going on hikes or bike rides works off extra energy while you pretend to explore. Something we always enjoyed was building things. Legos was probably our favorite tool, though blocks, tinker toys, and marble works certainly had their place! Sometimes we'd divide the legos, giving each person the same things to the littlest block then seeing what different things we could make out of our portion. 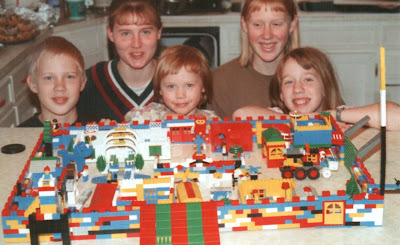 One time Miriam worked with us to make a huge town out of every single lego we owned! It took a while, but was a lot of fun! Music has and probably always will be a part of our family. We all play something, and often play together for family or group celebrations. Even when we were too young to play a real instrument, we had fake instruments so that we could all play trumpets together! Another great thing to do with youngsters is to let them help you cook. I know, it goes a lot slower when you have a pair of little hands trying to help. However, they enjoy it immensely, and while occupying them, you get something made for a meal or snack! One of James and Sara's favorite things to do when they come is to cook with Aunt Anna. We'll each find a special apron and bake away! There's definitely tons more to do: making paperdolls, coloring, going on a scavenger hunt, etc. Whatever it is, be creative, and have fun with the little ones in your life. They grow up so quickly! Marta and I loved dolls, as well as stuffed animals. We would play mothers and aunts. We would give them "baths" in the bassinet with colored blocks serving as various soaps. In Minnesota, we had a club with our stuffed animals and dolls. Several of were really like people. Five of our cousins lived next door to us in Norway. We would run down the hill to play with them when they came home from school. Though they were all 5-16 years older than I(I am the youngest), we had great fun. We would build giant snowforts in the winter. Cousins are special. Thank you for making me remember. Anna, such WONDERFUL memories to me as well as I watched you children enjoy playing together so much. You even included me in one of your pictures when I was young. I know I played alot more with the first 3 of you all, and now I look forward to playing more with all the wonderful grandchildren ! Wow, good memories! Thanks for posting these pictures!! Thank you Anna! Those were wonderful childhood memories... all the great times together whether playing outside or doing the many activities inside, I will always cherish those memories of great times together. I love you and miss you and miss times spent together. Thank you for sharing the memories! I look forward to seeing you in ~month.